The regime’s commemoration of the Iranian hostage crisis didn’t quite go according to plan. Almost three decades ago, a group of radical Islamist students, dressed in army fatigues or covered in scarves and black chadors, forced their way into the American embassy in Tehran. According to some accounts, Mahmoud Ahmadinejad, then a student at a second-tier technical college in Tehran, was invited to join the hostage takers. He declined, saying he would join only if they would also occupy the Soviet embassy in Tehran. “No to the West, No to the East” was in those days the much-touted slogan of the regime. The students, we now know, initially planned their action as political theater, no more than a daring stunt. After a few days, and some publicity, they intended to end the occupation. Regime leader Ayatollah Ruhollah Khomeini, however, had other ideas. Sensing the political gains of prolonging the crisis, he called the take-over of the embassy the Second Revolution and used it to consolidate his hold on power. Every year since, the regime has organized mass demonstrations to celebrate this brazen breach of diplomatic decorum as a way to bolster its own popularity. Yesterday, the regime tried to repeat this ritual--but something else happened on the way to the embassy. From weeks before, sources close to the Iranian Revolutionary Guards Corps (IRGC) and the Basij declared their intention to make the day into a showdown with the opposition, a day the regime would bring out its forces in full. In the words of Sobhe-Sadeq, the political organ of the IRGC, the world would be forced to accept that “the people” are with the regime, and that the democratic opposition is nothing but a silly handful of effeminate upper-middle-class sissies. Before regime supporters and critics took to the streets yesterday, another key development took place. Ayatollah Hossein Montazeri, now clearly the spiritual father of the Green movement, issued a remarkable statement, apologizing for the fact that, 30 years ago, as one of the leaders of the clerical regime, he had supported the occupation of the American embassy. It was, Montazeri declared, a foolish, costly decision, tantamount to a declaration of war. He went on to lambaste the regime for now selling the country cheaply to China and Russia. What is the difference between Russia and America, he asked, and why is it acceptable to give the former all kinds of concessions, while refusing to even negotiate with the latter? As the day wore on, it became clear that the regime’s attempt to intimidate people into silence or inaction had failed again. Regime critics showed up in impressive numbers. Hundreds were beaten by security forces, including opposition leaders Mir Hussein Moussavi and Mehdi Karubi. President Obama’s statement remembering the anniversary of the hostage crisis invited Iran and America to put the past behind them, and look to a better tomorrow. But his reference to the democratic aspirations of the Iranian people was too oblique. 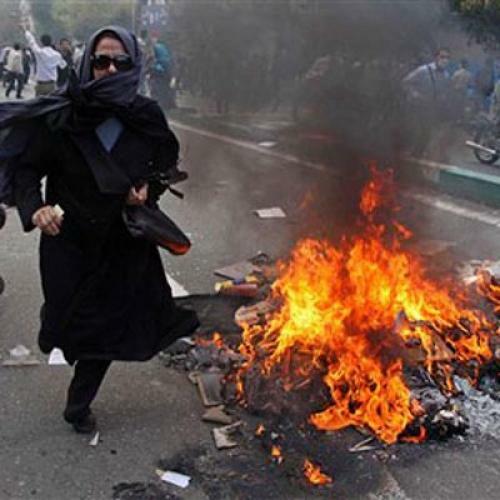 “The world,” he said, “continues to bear witness to their powerful calls for justice, and their courageous pursuit of universal rights.” In Tehran and several other major Iranian cities yesterday, people risked life and limb demanding these rights. Confirming that the world is watching leaves the question Iranians are asking of Obama--ba ma ya, ba anha--still without a clear answer. Abbas Milani is the Hamid and Christina Moghadam Director of Iranian Studies at Stanford, where he is the co-director of the Iran Democracy Project. His latest book is Eminent Persian: The Men and Women who Made Modern Iran, 1941-1979 (Syracuse University Press).